Trend Trading by the "Tens"
The trend trading futures trading strategy that I am going to describe here was brought to my attention in a book by George Kleinman called "The New Commodity Trading Guide". You can read the book review here. I will show two different examples using futures trading charts from my futures trading platform in the markets of corn and natural gas. The trading strategy is based on the idea that there exists significant psychological support and resistance around even numbers, numbers that end in zero. For example, numbers like 300, 400, 1000 all have significant support or resistance potential. The theory goes that the more significant the number, the higher the support or resistance potential. For example, 1000 and 2000 have much greater support or resistance potential than 300, or 340. That being said, the theory basically goes that any round number will demonstrate this effect. For example, in the corn market anything like 500, 600, 700 would be major. 520, 540, 550 and the like would be significant as well. Using natural gas as an example, numbers like 4.000, 5.000, 3.000 would be major. Numbers like 4.100, 4.200, and so forth would also be significant. Now, the key principle behind this system is that as prices penetrate theses round number support and resistance level, buying or selling entry opportunities arise. The idea being that if prices break through, with the price bar closing beyond the significant number, prices will follow through with additional momentum. As described by Kleinman, this futures trading strategy is a trend trading system. It works in trending markets, either up or down, but it does not work in sideways or choppy markets. This is a trend trading technique. Therefore, the first step in using this technique is to identify the trend using a slow moving average, say 150 period or maybe a little higher. If the moving average slope up then do your trend trading long, if the moving average slopes down then do your trend trading short. Let us first examine the example using natural gas. In the following futures trading chart that I prepared from my online trading platform using the daily time period, we see a strong downward trend. So, our trend trading will be with a bias toward shorting. Now that we have established the trend, let us look at how this market could have been traded. In this example, we will be using 0.20 increments as our "significant round numbers". For example 3.80, 3.60, 3.40 and so forth. I have labelled three short entries (the green arrows, # 1, 3, and 5) and three exits (the red arrows, # 2, 4, and 6). Let us start by looking at #1, our first short entry. As the price penetrated below the round number 3.80 and the daily bar closed on the short side of the 3.80 mark, we get a shorting signal. #1 indicates a short entry, a sell entry. A key to this technique is the trailing stop. A trailing stop is always used, the trailing size being the size of the increments you are using for your entry signals, in this case we are using 0.20. For this trade (arrows #1 to #2), we are looking at a profit of approximately 0.05 (approximately 3.75 to 3.70). Prices went as low as about 3.48, but then retraced upwards to around 3.70 triggering our 0.20 trailing stop. In natural gas, this is equivalent to $500 profit. Next, we will look at our second short trade (arrows #3 to #4). After our trade exit at #2, prices dropped and penetrated our significant number 3.60, the bar closed below giving us an entry signal. Entry occurred at approximately 3.55. Prices then tumbled as low as 2.30 without make a 0.20 retracement, thus we did not get stopped out of the trade. The trade finally came to an end when prices rallied to 2.50 (0.20 higher than the 2.30 low). This exit is indicate by the red arrow #4. Our trade went from 3.55 to 2.50, a 1.05 profit. This is good for a $10,500 profit in the natural gas market. Lastly, we will look at our third and final trade in the natural gas futures market (arrows #5 to #6). As prices fell after the brief rally, we entered as the price penetrated and closed below significant number 2.60. Our entry would have occurred at approximately 2.50. Prices then continued lower to penetrate 2.40 before retracing more than our allowed 0.20 above 2.60 causing our trailing stop of 0.20 to be triggered. Exit would have occurred around 2.60. We would have lost 0.10 in this trade, an equivalent of $1000 in the natural gas futures market. We made three trades, one marginally profitable, one very profitable, and one marginally unprofitable. $500 + $10,500 - $1000 = $10,000 profit over approximately 3 months for one contract traded. You can see how this technique can be very profitable if, and this is a big if, the market is trending strongly. 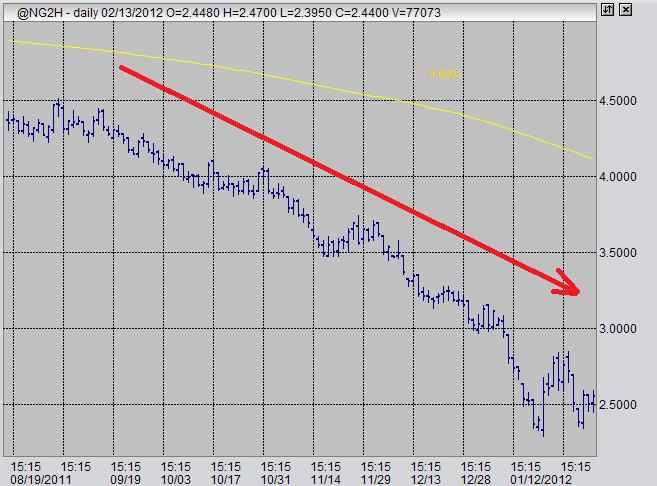 Let us now look at our following example using corn futures on a 60 minute futures trading chart. In the following chart we see three trend stages confirmed by our slow moving average. First we see a down trend, then we see a sideways period, then we see an upward movement. This gives us three contexts in which to test this trend trading system. In this example, we will use 10 as our significant price increment and our trailing stop. Our round numbers will be 590, 600, 610, 620, and so forth. I won't go through the step by step with this example, but look at the chart carefully. You can clearly see that trend trading during the strong downward and upward trends at the beginning and end of the chart would have been quite profitable. However, we can also clearly see that trades placed during the middle sideways choppy trading range would have been problematic and full of losses. If you had chosen to follow this trend trading strategy during that sideways action, you would have been whipsawed again, and again taking losses upwards of $500 per contract each time. These losses could have easily nullified the profits made on the down and up trends. If you choose to trade using this futures trading system, you have to have a defined and proven method of identifying trends and whether or not they are likely to continue so as to avoid these sideways periods. You can still trade the sideways periods, just switch to a different trading strategy. Some people would just rather switch to a different market instead. This trend trading system has several merits and several flaws. It has a defined exit strategy. This is good because it limits our losses and sets our profitable exits without letting our emotions take over. It is extremely profitable in strongly trending markets. It fails harshly in sideways markets because one could enter several unprofitable trades in a row. I personally used this strategy very profitably in oats futures when prices rallied dramatically in the spring of 2010. Oats was the first of the grains to rally in that very nice grain complex bull market. However, that is the only time I have used this technique as an entry strategy. The truth is I don't like it. What I do like is the way I have adapted it to be an exiting strategy. I frequently set my exits and round numbers, and I love the idea of using trailing stops. I'm sure this technique works very well for people that take the time to adapt and perfect it, but I prefer other futures trading strategies. That being said, I really think that this technique deserves mention because it has a lot of potential. And just like rebuilding old cars, sometimes the best futures trading systems are designed from other systems that you yourself break down and rebuild from scratch using a hodge-podge of bits from here and there.